The first leg of the Men’s ETTU Cup quarterfinals concluded tonight. Germany’s Liebherr Ochsenhausen won in Spain, Stella Sport La Romagne secured valuable win in Sweden whilst Bogoria and Wels celebrated at home soil. Cajasur Priego suffered at home soil. Germany’s Liebherr Ochsenhausen showed no mercy and concluded first leg in straight matches. 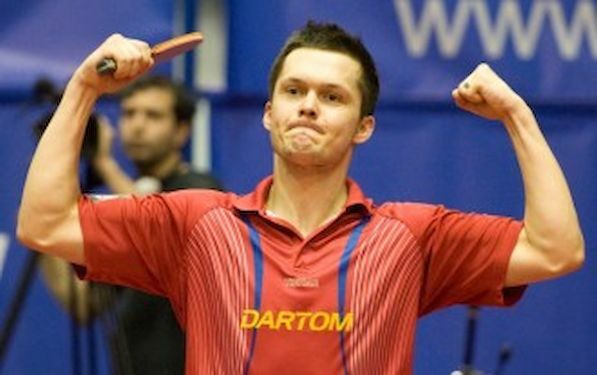 Crowned champion of the Men’s Under 21 Event at the GAC Group 2013 ITTF World Tour Grand Finals in Dubai Simon GAUZY overcame SHI Wei Dong in the very close encounter to secure the first point for Liebherr Ochsenhausen in Spain. Despite the four games victory it was thrilling duel, which went to GAUZY’s account after 15:13 in the last game. The situation worsened for the hosts after the match between Carlos MACHADO and RYU Seung Min. German club made a safe difference with 2:0 lead. Alejandro CALVO could not stop Liam PITCHFORD, who sealed the match with 3:0 victory. Stella Sport La Romagne beat Eslov AI in Sweden. Robert SVENSSON gave hosts the lead after straight games victory over Abdel Kader SALIFOU, but CHEN Tianyuan after fierce fight in five games beat Kasper STERNBERG to level the score. Brice OLLIVIER continued in the similar style. Mattias OEVERSJÖ won the first set, before the French player won next three. SVENSSON preserved winning spirit and beat CHEN to level the score once again and to prolong the match to the fifth match. Abdel Kader SALIFOU needed only three games to finish the duel in favor of guests. Austria’s Walter Wels beat TTC Zugbrucke Grenzau at home soil. The backbone of Wels success was ZHAN Jian who won both points. In the opening duel ZHAN Jian had very tough task against Lubomir JANCARIK . JANCARIK won first game and put ZHAN under severe test. ZHAN needed full five games to overcame dangerous Lubomir. However, the lead lasted very short. Croatia’s Andrej GACINA beat Zoltan PETE without big problems. Lehel DEMETER beat Tomas PAVELKA, to bring hosts one-step closer to first leg triumph. ZHAN Jian was once again on duty and this time GACINA was only able to took one game from him. In Poland Dartom Bogoria Grodzisk Mazowiecki beat Saarbrucken after great fight. Host representative Daniel GORAK was stretched to full distance in the first duel of the match. Bojan TOKIC managed to recover twice to nullify GORAK’s lead, but in the decisive game Daniel concluded the match in very effective style. In the match between OH Sang Eun and Bastian STEGER, experienced OH started in very effective way with 11:3, but that was it. From the second set, STEGER took full control and Saarbrucken was back in game again. Tiago APOLONIA added another point to Germany’s account with victory over Robert FLORAS. STEGER missed few opportunities to finish the match. In fifth game after 12:10 , GORAK secured one more entrance in arena for OH Sang Eun. Korean beat TOKIC in another full distance match. In only quarterfinal match in Women´s ETTU Cup tonight, in Lys-Lez-Lannoy, Club Pongiste Lyssois Lille Metropole beat Russia’s Tyumen. YANG Xiao Xin gave hosts good start with the victory over Polina MIKHAILOVA in four games. Duel between Bernadette SZOCS and Ruta PASKAUSKAINE went on young Romanian star’s account. Former European champion had 2:1 lead , but Bernadette stayed calm and won the duel in five games. Veronika PAVLOVICH lost against Agnes LE LANNIC so Alexandra PRIVALOVA got her chance. However YANG Xiao Xin stayed at the top of the game and concluded the match in favor of hosts. Leistungszentrum Linz Forschberg won the opening leg of the Women’s ETTU Cup quarterfinal. In Austria, French ALCL Tennis de Table Grand-Quevilly failed to took advantage of 2:1 lead, before duel ended in five matches. LIU Yuan fought hard at the beginning of the match but managed only to stretch LI He too full distance. That did not discourage Camelia POSTOACA who beat LI Xue, European bronze medalist from Herning, in four games, to level the score. Kristyna STEFCOVA proved too weak for Marina BERHO, so the guests were in the lead once again. In fourth encounter of the quarterfinal LIU Yuan made LI Xue’s day even worst; French player left the court beaten for a second time in the match. Camelia POSTOACA beat LI He in the decisive match and with second win today secure opening leg victory for hosts.